Last week, Daisy Ridley claimed that Star Wars: Episode VIII director Rian Johnson will not be as secretive about his upcoming sequel, which we've already seen proof of with a few photos from the set that have surfaced. Unlike J.J. Abrams, Rian Johnson does have an active presence on Twitter, which he used yesterday to share what appears to be our first look at the Millennium Falcon. While the director didn't specifically identify the iconic ship, his new photo features director of photography Steve Yedlin standing outside what appears to be the Millennium Falcon cockpit. Here's what the director had to say below. "Cinematographer Steve Yedlin. Hard to believe that today we wrap up week four, it is just flying by." Of course, we don't expect Rian Johnson to spoil parts of the story for Star Wars: Episode VIII, but this sequel has the luxury of avoiding one big secret, the look of Luke Skywalker (Mark Hamill). Aside from the photo from the now-iconic table read, and various photos outside the set posted by Mark Hamill himself, we never saw the actor in full costume as Luke Skywalker in any of the photos or footage of Star Wars: The Force Awakens, until the movie opened on December 18. The actor only appeared in the final scene, where he is met by Rey (Daisy Ridley) at his hidden Jedi sanctuary. When production began on Star Wars: Episode VIII, LucasFilm shared a brief video from the set, which revealed that the story picks up right where Star Wars: The Force Awakens left off, on this mysterious island. These scenes were actually shot months before principal photography started, during a fall shoot on Skellig Michael Island, since the production only had a limited amount of time to shoot on the island. Still, we haven't learned anything else about the story since then, but hopefully LucasFilm will release new plot details soon. Star Wars: Episode VIII is written and directed by Rian Johnson. This highly anticipated sequel continues the storylines introduced in Star Wars: The Force Awakens. Coming back are cast members Mark Hamill, Carrie Fisher, Adam Driver, Daisy Ridley, John Boyega, Oscar Isaac, Lupita Nyong'o, Domhnall Gleeson, Anthony Daniels, Gwendoline Christie, and Andy Serkis. New cast members will include Academy Award winner Benicio Del Toro, Academy Award nominee Laura Dern, and talented newcomer Kelly Marie Tran. 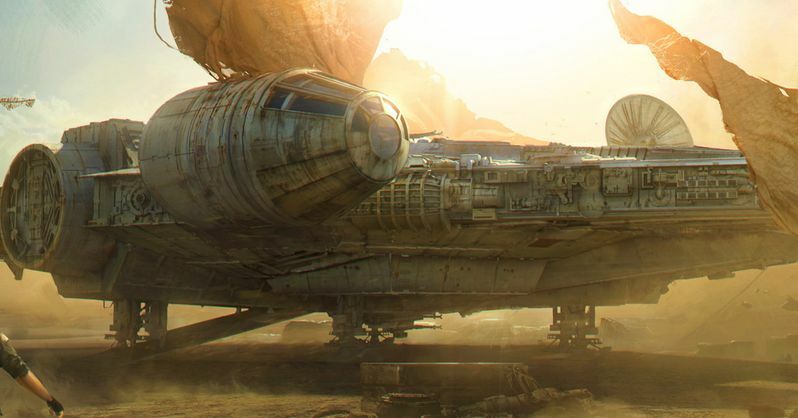 The presence of the Millennium Falcon certainly isn't surprising, since it's one of the most iconic ships in the entire franchise, and it's how Rey, Chewy and R2-D2 got to Luke's exile planet of Ahch-To. But it's still a tad bittersweet, since we know its iconic pilot has passed on. Harrison Ford's Han Solo was killed by his own son, Kylo Ren (Adam Driver). In the final scene, where Rey visits Luke Skywalker, Rey flew to this distant island with Chewie, although we don't know if she will take over piloting the Falcon in this sequel. While we wait for more details, take a look at the latest Star Wars: Episode VIII photo below.